As Trump 17 of the Major Arcana, the Star is one of the most hopeful cards in the deck. 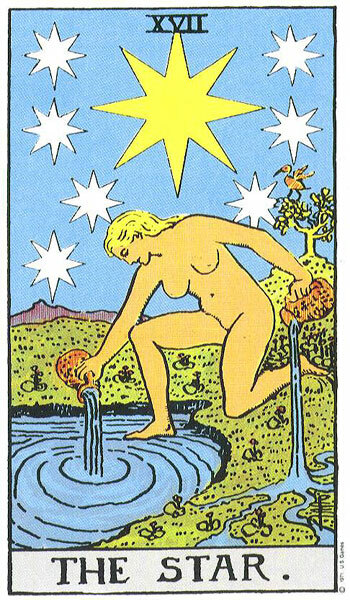 Symbolizing balance, harmony and all things associated with Aquarius, it’s both the card of peace, compassion and of having your dreams come true. New opportunities abound for you and you attain your highest potential. In matters of romance, you follow your heart and your intuition and will not be led astray. In matters of creativity, you are on the right track to receive the inspiration you need to lead to profound success. 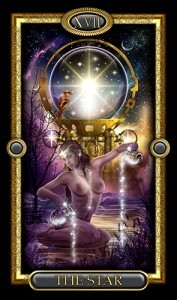 In a reading, this card guides you to wish upon a star, particularly for any endeavor that’s close to your heart. If you do, the path to tranquil achievement will be opened for you.